Have a question - we brought home our White Hawk 28dsbh a couple of days ago and after playing around with the stereo and tv (television), I can't seem to get the tv sound to come through the stereo speakers. I was able to do this in our 23B and am assuming one can do that with the IRV system. I put the "mode" to a/v and still get no sound coming through the stereo speakers. the "aux" mode would be used for a mp3 player if I'm not mistaken? I did pull the stereo out and checked the hook ups to the back of the receiver and believe they are correct. I tried to check on the back of the tv but I think I need to take it off as there isn't much room to get my hands behind it. How does one get the tv off? Are there snap pins to get it off the bracket? I also have an issue with the speakers in the bedroom. Both should turn on and off by pushing button "B", one speaker works with this button, the other is wired to button "C" and goes on and off with the outside speakers. So any help would be much appreciated. Thanks in advance. After some looking - I realized I have one bedroom speaker and one outside speaker wired together that operate on the same on/off switch (B) on the stereo - as do the other bedroom and outside speaker operate on switch (C). I'm under the impression this is wrong as the bedroom speakers should turn on and off using the same button (B) as should the outside speakers (C). It appears you have the same setup we had in our TT with a 32 inch Jensen TV mounted to the rotating platform with a fixed mounting bracket. Believe me it is very difficult to dismount because it is nearly impossible to get to the spring-loaded levers at the bottom of the mount. I dismounted ours twice with the fixed bracket. The first time was extremely hard because I couldn't find anyone on this forum or elsewhere who knew exactly how to release the bracket. I finally bought a video snake and discovered the location of the levers. The next problem was figuring out how to get to the levers. If I remember correctly I finally was able to reach the levers from the bottom of the TV. Once removed, I disconnected the bracket from the old TV and installed the new 12 volt Jensen TV. It is pretty much the same TV only 12 volt DC instead of 120 volt AC because we like to dry camp. 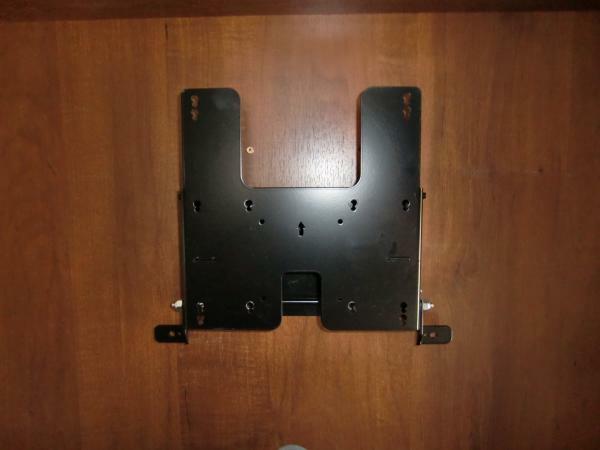 This bracket is an overkill for the weight of the TV but it has a locking pin for traveling and does not twist out of alignment. I recommend this one because it is so solid. An added benefit is that the connectors on the back of the TV are now easily accessible. Anyway, here are a few photos. Hope they help. "We're all here because...we're not all here"
DO NOT waste your time & money on this bracket. It was the first one I installed and after each trip I noticed that the TV was twisted out of alignment. Spend a few extra bucks and get the TV1006H - you can thank me later - ha. As I cycle through the "modes", I find that I only have blue tooth, something for an iPod, a/v, and aux.........no "tv audio" mode. As for the speakers, I plan on pulling it out and see if I can switch some wires around. You must have a different setup than mine. Sorry I couldn't help. Its possible that the TV has not been wired correctly to the radio/CD/DVD unit. I noticed in my new TT that the video lead goes to the TV's input and the audio leads go to the TV's output. Plus there is an extra cable in the bag with the remotes. I'll be sorting it out while we are camping next weekend. Aren't 21st century electronics FUN? I did throw in a DVD yesterday and the sound came through the stereo speakers, just can't get the plain tv audio to come through. I found the other cables in the bag that came with the camper and played with those for a bit but no success. I guess its not a huge deal, at least I can get the sound coming through when watching a movie. My TV sound comes through either aux 1 or aux 2. Try that if you haven't already. If that works, you will just have to switch the wires for the outside and bedroom speakers.